Map showing the path of the total solar eclipse of Aug. 21, 2017. 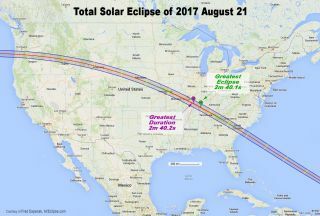 Editor's note: This story, originally posted on April 8, was updated Aug. 19 with additional resource links for the total solar eclipse. The duration of totality, as experienced by observers on the ground, tops out at a few precious minutes for all total solar eclipses, and some don't even last that long. The umbral shadow is projected out into space by the moon and is shaped like a long, tapering cone. That shadow cone is about 235,000 miles (378,000 kilometers) long. But the moon's average distance from Earth is about 239,000 miles (385,000 km). So, in order for the umbra to touch the Earth, it must be closer than the average Earth-moon distance. But even when the moon is at the closest point to Earth in its elliptical orbit, the umbra is but a dark "dot" measuring no more than 170 miles (274 km) across. And many times, the shadow width is considerably smaller than that. During the Aug. 21 total solar eclipse, for example, the shadow will average only about 68 miles (109 km) wide. The other thing to take under consideration is the speed of the shadow. During its orbit around Earth from west to east, the moon moves at an average speed of 2,288 mph (3,683 km/h). Because the natural satellite is traveling in an elliptical orbit, the moon's speed is not constant; the object moves faster when it's closer to Earth. The moon's shadow moves at the same speed as the moon itself. So one might think that during a solar eclipse, the speed of the moon's umbra on the Earth would average close to 2,300 mph (3,700 km/h). The moon’s shadow on Earth, as seen by the NASA-NOAA Deep Space Climate Observatory (DSCOVR) spacecraft during the total solar eclipse of March 8-9, 2016. 1) The Earth is rotating on its axis in a west-to-east direction. 2) The Earth is a sphere. In the first case, since Earth is turning in the same direction that the moon is traveling, any particular spot on Earth's surface is, in essence, "racing" the moon's shadow across the globe during a solar eclipse. And how fast any particular spot on Earth moves depends on its location: The planet spins fastest at the equator: 1,037 mph (1,670 km/h). Let us say, for example, that the moon's shadow is moving west to east along the equator at an average speed of 2,288 mph (3,683 km/h). But Earth's rotational speed at the equator makes the ground speed of the shadow 1,251 mph (2,013 km/h). Some military jets have actually flown faster than this and are capable of outracing the moon's shadow for short distances. The other thing to consider is that the moon's shadow is being projected not onto a flat surface, but onto a sphere (Earth). Near the middle of the totality path, the shadow is moving at its slowest along the surface of the planet. But at the very beginning of the totality path, and at the very end, the shadow is striking Earth at a very oblique angle; at these points, the shape of the shadow on Earth resembles an extremely elongated oval, or even a cigar. In fact, at the moment that the shadow is just moving onto (or off of) the Earth's surface, it is traveling at infinite speed, because at these points the axis of the lunar shadow cone is tangent to the globe of the Earth. When the shadow begins to move onto the Earth's surface (at local sunrise), its speed begins to slow as it travels, in essence, "uphill," over the curve of the Earth. Later, as the shadow begins to move toward the end of its path (at local sunset), its ground speed increases as it moves "downhill" along the curve of the Earth, ultimately sliding completely off the planet's surface. On March 8, 2016, I was one of 163 lucky passengers on board an Alaska Airlines 737-900 jet, which intercepted the moon's umbra over the Pacific Ocean en route from Anchorage to Honolulu. When the shadow enveloped our aircraft, we were 700 miles (1,130 km) north of Honolulu and very close to the sunset point of the eclipse path. The upcoming total solar eclipse on Aug. 21 marks the first time that the umbral shadow will cross the lower 48 United States from coast to coast in 99 years. During this landmark event, when the shadow arrives at the coast of Oregon, it will be moving at 2,240 mph (3,600 km/h), which, coincidentally, is very close to the average orbital speed of the moon around Earth. The moon's shadow, however, will still be approaching the midpoint of its path, and still climbing along the bulge of the Earth. The lowest speed will take place in Tennessee, to the southeast of the point of greatest eclipse (the instant at which the axis of the moon's shadow is closest to the center of the Earth); the speed there will be 1,323 mph (2,129 km/h). The maximum duration of totality for this eclipse will be 2 minutes and 40 seconds. After the shadow passes through the midpoint of the eclipse path, it will begin to accelerate as the slope of the Earth curves away from it; the shadow will then be moving downhill, ultimately sliding off Earth's surface over the waters of the eastern Atlantic Ocean. As the umbra bids a fond farewell to the United States at the coast of South Carolina, the shadow will be moving at 1,354 mph (2,179 km/h). See the table below for eclipse characteristics at various spots along the path of totality. How the total solar eclipse of Aug. 21, 2017 will vary according to viewing location along the path of totality. In short, the moon's umbral shadow will take a "leisurely" trek across the United States, covering 2,496 miles (4,017 km) in just 90.7 minutes, whizzing by at an average speed of 1,651 mph (2,657 km/h). And that's why the total phase of a solar eclipse cannot last very long! Editor's Note: Space.com's Night Sky columnist, Joe Rao, will be giving a presentation about the upcoming total eclipse ("How to Survive the Aug. 21 Total Solar Eclipse") on Sunday (April 9) at 2:45 p.m. at the Northeast Astronomy Forum (NEAF), which will be held this weekend at the SUNY Rockland Community College in Suffern, New York. NEAF features displays of telescopes, telescope accessories and other astronomy-related products, as well as presentations by scientists and skywatching experts. For more details about NEAF and a full schedule of events, go to: http://www.rocklandastronomy.com/neaf.html.